Should I put this one on the list? Albion is by far one of the favorite spots in Utah. In fact, we love it to death. 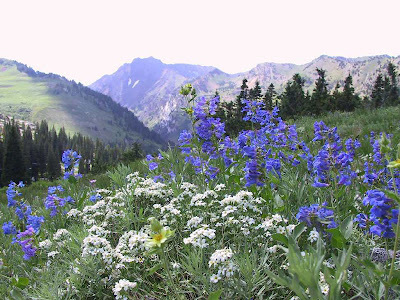 I am afraid too many people go there when the flowers are blooming, and the Forest Service encourages them. There is a long dirt grade climbing up the hill to Albion from the Alta parking area, and sometimes it is choked with cars and dust. 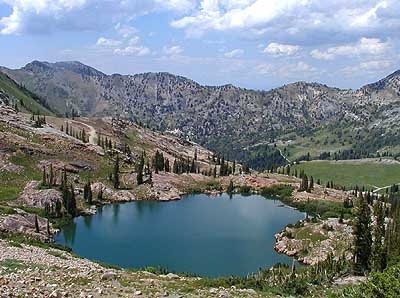 Of course, the destination from Albion was always the Cecret Lake Trail. The lake is an alpine gem a short hike above the parking area at Albion. It is beautiful beyond compare. Like all alpine lakes, the water is cold and crystal clear. The air is crisp and clean, even in mid-summer. Crowds of people don't seem such a bother. But the area is generally crowded all the time now, to the point that it is difficult to find a parking place in Albion anymore during weekend hours. For me, at least, that spoils some of the enjoyment of what wilderness should be. What can we do? I don't know? It worries me. Someday I think it will become more like Disneyland. I think that there will always be other treasures that remain unspoiled. You obviously know where they are. You have to allow for the fact that people who aren't going to tredge across hill and dale to find the hidden treasures are going to flock to the ones with easy access. Let them have them, while you stow away quietly to the secret havens, as you always have. The truth is, Albion will always be one of the finest if places. The have solved problems like this in places like europe without destroying the place in the process. And here too. Look at Cascade Springs, just a few miles away. A solution has been arrived at to handle much larger volumes of people without destroying the Springs. Albion needs something like that to rescue it. I know it has been a long time since this post... My children and I have ventured to Cecret Lake. One of the most joyous hikes I have taken. You know, I think< that I have taken on a personal challenge to make one of these hikes as often as possible! I treasure your input Jim, as I take my children and grandchildren on these hikes. My husband is not able to join us but fully supports all that I intend in bringing them closer to God and nature through these hikes. I believe this is one way all mankind can connect with The One Supreme Being who knows the intent of our heart the best!